Dream holidays always point in the same direction: south. To the south, where mountain peaks stretch up towards the sun, Alpine lakes lie nestled at the feet of rolling hills, and where lifelong friendships are forged. All this comes together in Austria’s southernmost state: Carinthia. 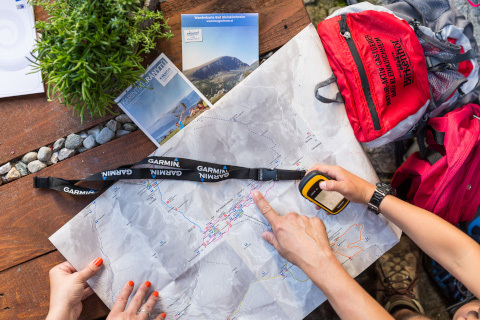 Popular destinations in Carinthia are its spectacular natural sights (such as the dripstone caves and national parks), scenic routes, mountain railways, boating on the lakes and many fascinating museums, while an extensive network of well-groomed hiking trails interconnects the mountains. Carinthia is one of the main recreational vacation sites as well as the most important skiing area. The town of Bad Kleinkirchheim is located at an altitude of 1,100 m above sea level, resting in a 5 km-long valley edged in 2,000 m-high mountain ranges. Its exquisite natural beauty is complemented with an excellent climate. Over the years, this municipality has become one of Austria’s most important sport centres, both in winter and summer. Besides swimming and horseback riding facilities, it also has covered and open-air tennis courts. While its 18-hole course draws golfing enthusiasts during the summer season, the most popular activity here is hiking. Approximately 100 km of well-marked trails wind their ways through woodland, meadows and sunny mountain slopes. Comfortable hammocks – “wellness oases” – have been placed along the way, near sparkling brooks, refreshing waterfalls and glistening mountain lakes. 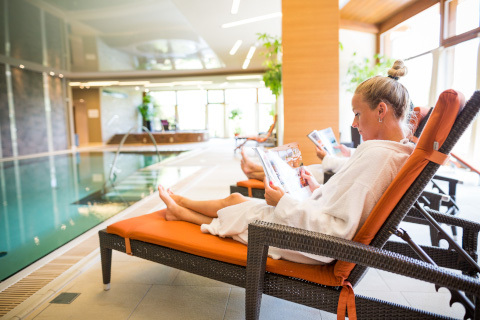 Large swimming pool (16 m x 6 m; 27 ºC ), sitting pool (Ø 3.2 m; 34 ºC) cold water bucket shower, Finnish sauna, steam room, infrared sauna, chaise longues and a SPA area for relaxation. 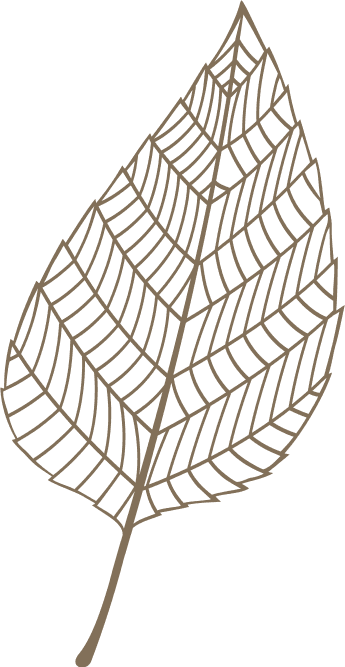 Rest, relax, and emerge revitalized! For children, we have a well-equipped playroom, a PlayStation area and a playground in our garden. Our hotel is equipped with everything you need when travelling with a baby, while our restaurant offers the younger generation a special children’s menu. If you’re in the mood for some pampering and relaxation, try our relaxing, anti-stress and invigorating spa treatments, including a variety of massages and wraps using natural healing techniques to enhance your physical and mental wellbeing. Our exercise room equipped with Technogym exercise machines also has an incredible view over the mountains, while our squash courts are also at your disposal. Covered and open-air tennis courts are available (for a fee) in the town. Culinary delights, thematic evenings. 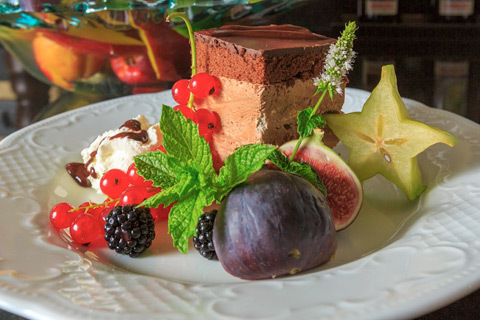 We use premium quality locally sourced ingredients, and offer Hungarian and international cuisine, a children’s menu, a five-course dinner menu or buffet evenings. Customised dishes can also be prepared to meet your individual dietary needs. Our hotel has a two-lane bowling alley and an air hockey table. We also offer various other activities such pool, table football, darts and a ping pong table in our exclusive rec room. Cards, board games and chessboards are also available – everything you need for a laid-back evening with friends and family! If you want to learn how to ski, or even if you would just like to ask for some tips about the best ski runs or ski pass deals, ask our staff at reception. You can leave your equipment in our ski room, and buy your passes with us to avoid queuing at the ski hill. Our hotel offers guided hikes from spring until autumn. After supper, you can join a torch-lit hike in the village, followed by a drink in the hotel’s bar. Or, you can join in one of the unforgettable hikes held by the Berggeniesser group. 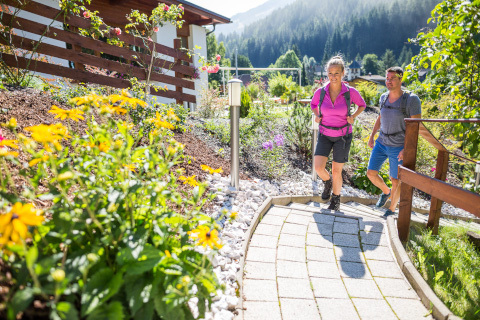 Hiking tour guides organise a sunset hike, a sunrise hike, the Valerian hike, and other spellbinding moments… You can borrow backpacks, walking sticks, hiking maps and directions at the hotel’s reception, and order a tasty packed lunch of Carinthian treats from our restaurant. 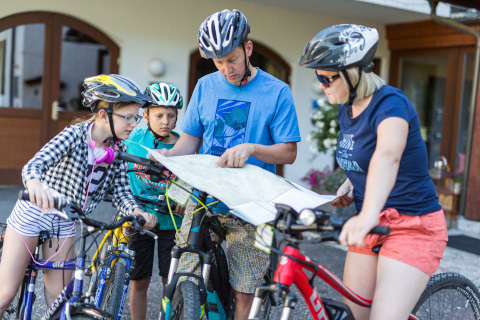 From spring to autumn, our guests can also explore the area on a bicycle – whether on the more challenging mountain trails or easier lakeside paths. Our hotel offers free bicycle rentals for all ages, and our reception staff will be happy to tell you more about E-bike rentals as well. The 18-hole Championship course and the 6-hole golf practice centre of Bad Kleinkirchheim lies right next to the Kaiserburg. With very pleasant climatic conditions - even during the hottest summer days – the well maintained meadow and forest holes are offering an excellent playing experience. Take a look at the Birkenhof’s special golfer packages. It provides free access to the town’s many activities and organised tours. And if you’d like to have a break from driving while you’re on vacation, take advantage of the local tour bus service at your disposal. Every day, our staff organise a range of activities for our guests: hiking, wine tastings, torch-lit hikes, bowling or ping pong tournaments. Our pizza baking days are especially popular with children. If you are interested in the life of the hotel, the programms, click here! Fantastic hotel - friendly, but professional staff. After 9pm you can expect 100% silence in hotel - with just one goal - to provide you good rest for the next day. It is obvious that a lot of attention has been paid when designing hotel restaurant, lobby bar and swimming pool. Food quality is one of the best we've ever experienced in hotels. Also, we were offered to buy ski pass in the hotel and to save some time. We had few nice (positive) surprises, but I won't go into details to avoid spoiling other guests stay. Great location, very nice and clean, loved the swimming pool, friendly staff. A very decent boutique sized hotel with excellent pool and sauna plus good facilities for children. Sehr positives Erlebnis, wir kommen gerne wieder. Es waren zwei schöne Tage! Why book your room directly from us? I do not want to miss the special offers! I agree to the fact that Hotel OTP Birkenhof provides me information on our latest news, specials, and activities, shares recreational and culinary tips with me through the Birkenhof Post.
. Hotel OTP Birkenhof © All right reserved!